Direct injection is not only something for diesel and gasoline engines. In compressed natural gas (CNG) engines, it could also make cars even more economical and eco-friendly. Driving enjoyment would also be boosted: compared with present systems that use manifold gas injection, it could deliver as much as 60 percent more torque at low rpm, and offer the prospect of an even more dynamic driving experience in the CNG cars of the future. However, there is still no technology for directly injecting natural gas into the combustion chamber. 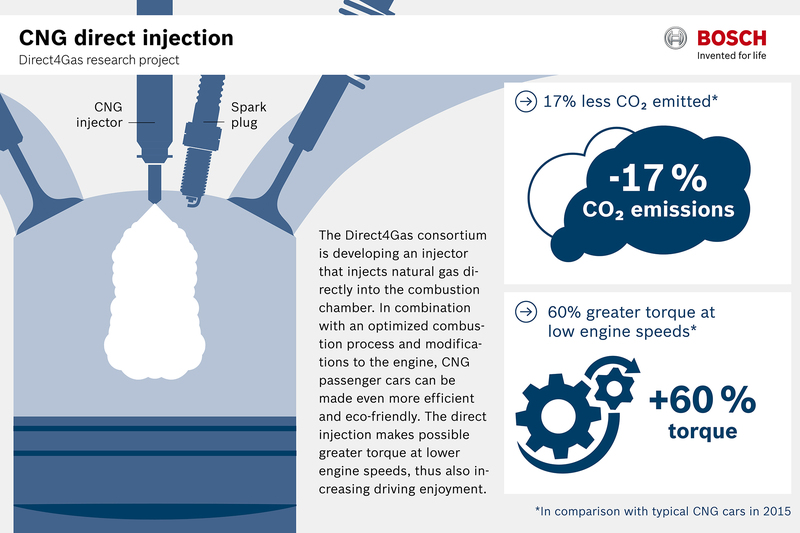 In the Direct4Gas project, researchers now want to develop a direct injection system for monovalent engines, or engines that run exclusively on CNG. Even now, there are plenty of good reasons for choosing a CNG engine. The compressed natural gas used in passenger cars is inexpensive, and emissions from the vehicles (and thus also vehicle tax in many countries) are low. But this alternative fuel has much greater potential: CNG is mainly composed of methane, whose chemical composition means that cars powered by natural gas could emit far less CO2 than at present. In combination with modifications to the engine, the saving could be as much as 33 percent over a comparable gasoline-powered car. However, this all depends on combustion processes that are tailored precisely to natural gas. By 2020, newly registered vehicles in the EU will not be permitted to emit more than 95 grams of CO2 per kilometer on average. By 2025, this limit could be even lower. Efficient CNG vehicles can help meet exacting emissions standards, and this not only because they emit less CO2. Emissions of particulate matter are also significantly lower than from gasoline or diesel engines. Today’s CNG vehicles are generally bivalent, running on gasoline and CNG with engines designed for gasoline direct injection. For CNG operation, they are fitted with an additional manifold injection system for methane. “The problem with this configuration is that neither the combustion process nor the values for efficiency and emissions can be optimized. For this to happen, the CNG – like the gasoline – needs to be injected directly into the combustion chamber,” says Dr. Andreas Birkefeld, the project leader from Robert Bosch GmbH. Because methane behaves differently from gasoline when injected directly, it is important to optimize the combustion process for methane. The Direct4Gas researchers and engineers will design samples of a direct injector that satisfies much higher standards than the manifold injection valves used up to now. It will have to be especially robust, gas-tight, and reliable, and meter the CNG very precisely. Modifications to the engine itself are to be kept to a minimum, so that the industry can continue using the same components as for gasoline engines. The project team will equip experimental gas engines with the newly developed injector, and test it in the laboratory and in vehicles. Researchers will also examine mixture formation, ignition, and exhaust-gas treatment and develop specific solutions. Direct injection will also be superior to manifold injection in the low-rpm range that is so important for handling: the researchers estimate that direct injection will increase the amount of torque that can be delivered by as much as 60 percent. This would make the CNG engines of the future significantly more dynamic. The long-term objective of the consortium of automotive suppliers and automakers is to create the conditions needed for making the technology ready for production, and the project is an important step toward this goal. The consortium is led by Robert Bosch GmbH. Other partners include Daimler AG and the Research Institute of Automotive Engineering and Vehicle Engines Stuttgart (FKFS). Umicore AG & Co. KG is an associated partner. Following a resolution of the German Bundestag, Direct4Gas is supported with 3.8 million euros from the Federal Ministry for Economic Affairs and Energy as part of the “Increasing vehicle powertrain efficiency” initiative. The project started in January 2015 and will run until the end of 2017.